A question to myself the other day, what’s in an email address. It’s what defines us, a central point in time and space. Our identity, our login and our method of communication. So what finger prints are we leaving behind….. if you’re into social media, loads. From my email address I managed to decduce, well not even deduce it was staring me in the face. “So what!” I hear you cry. Well I’ll tell you, loosely coupled data. With one email address think about the follow API’s together: Facebook, Foursqure, MySpace, Flickr and I can make up a pretty convincing marketing picture. Add Hadoop to the mix and I can collate/mine/store and sift through tons of data in a short space of time and pretty cheaply. It’s not like this is even coming, it’s all here and it’s all for the taking. I’m a big fan of subscription services from makeup (no I don’t), to shoes, condoms, socks and even tamponia (nope not them either). Pay your money each month and receive your goods on a specified date, or very near it. For example, you pay on the 1st of the month then choose your items by the 6th and they arrive with the customer by the 10th. Should be like clockwork if the supply chain is right and your stock monitoring is good. Customers can plan their lives around your deliveries and safe in the knowledge that the next package arrives on a certain date on their doorstep and the whole cycle goes round again. Everyone’s happy. Until the supply chain goes bad and you really piss your customers off. 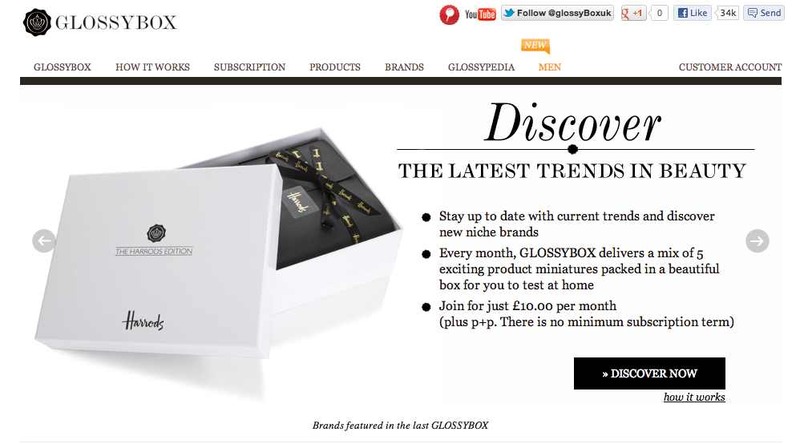 Glossybox is such a service and it seems to have become foul to a very simple supply chain issue, the Easter holiday. So when your scheduled delivery is on the 10th you know you are about to unleash all manner of hell by telling your customers they won’t get delivery until the end of April (25th) well there’s going to be words said, subscriptions cancelled and a rebellion on Facebook. A few days here or there and most would have turned a blind eye, this was two weeks. It happened. And these are my three observations…. The Royal Mail deliver things, the Royal Mail have holidays too and like Christmas you know there’ll be a cut off point. Royal Mail are not to blame you are ultimately responsible for posting early to keep a smile on your customer’s face. Customers don’t need a feast or famine approach with your stock. The regularity of your subscription means they are fitting your product in to their lives. If you rock the boat, which Glossybox did to the tune of two weeks, then all manner of issues occur from your customer running out of stock to then having too much when the next delivery arrives. As a service the last thing you want to do is give your customer an excuse to run out to a competitor. 3. This could have easily been avoided. Okay Easter ran into a unfair time for Glossybox with Good Friday being so close into the month and then no postal delivery or collection until the following Tuesday. I still think with some planning, data review and customer communication they could have pulled a small customer win. A few late nights from staff would have ride the storm as well. And if employee loyalty was high they wouldn’t have minded at all to keep customers happy. If there’s one sentence I hear most of from people wanting to start something it’s that. I’m not talking about the tech startup scene or investment vehicles to exit a company with a 3.5x multiplier. I’m talking about something a lot simpler, someone just wanting to make a decent living from week to week. The reality is that if you want to set up as a hairdresser, window cleaner or open a small popup shop then there are going to be startup overheads. So the sentence, “If I had ? ?1000 I could……” is now the biggest stumbling block between lifting people off the unemployment ladder or keeping them there. I have an idea….. Sammy Wilson if you’re listening I want a million quid.
? ?1000 to 1000 individuals. They pay it back too over the course of 12-18 months. So the cost to the tax payer over 18 months would effectively be zero. Everyone’s happy. With ? ?1000 someone could get setup, print their flyers and get selling. Even if it was the minimum wage of ? ?6.08 we’re talking the following figures. Investment of ? ?1,000,000 to fund 1000 people in the community. All 1000 will be expected to earn the minimum wage of ? ?6.08 per hour and work 36 hours a week. It makes good PR but with the personal allowance for 2012/13 at ? ?8105 the income tax generated wouldn’t be huge. But it takes 1000 off the unemployment register and that’s a good thing, promotes well being and shows that people given the right help want to do stuff. Where would the million quid come from? Well there’s going to be ? ?5m sloshing about from the Tesco Tax so I don’t mind borrowing it from there and putting it back in 12 months time. This is what the local enterprise agencies should be promoting in my opinion and I’m not just talking Northern Ireland, this should be UK wide. People do want to work you just have to give folk the encouragement to do so. Instagram – take the money and run. You would though wouldn't you? So what does all? ?this prove? Well there's money in that there data, that's for sure. This isn't about new users as I would wager the majority of Instagram users are already on Facebook. So what's Facebook have really bought is the social graph of pictures…. It's about users, relationships, media, comments, likes, tags, locations and geographies. The cost, yeah it's way over priced or is it? FB are not buying the application, let's be honest anyone can do that, they are buying photographic user interaction? ?to the? ?tune of 25 pics a second (as stated in Oct??2011).? ?That's over 2 million uploads a day (it will be a lot more now),? ?for data and insight that's??cheap. The Zuckerberg camp obviously know what they want to do with that data. This is a power play in data and a disaster for investments, there's another bubble coming me thinks. Thoughts on Pinterest but we’re only scratching the surface. Let’s get one thing out of the way, I like Pinterest and the idea of social sharing, if it’s social as you’re usually sat a computer not being social and pinning stuff. So that’s been done startups, we can move on now, done, finito it’ll transform retail, well it won’t but it’s a great hyperbowl to chuck the tech press and get them all exited. So here’s where I want it to go…. Consumer wants are based on the psychological instinct. Like Jesse J’s outfit you’ll scramble to to Google to try and find it or something remotely like it (well I won’t as I don’t have that sorta fringe). It’s time to look at the medium again, watching stuff moving stuff. Your satellite subscription is linked to your payment card or bank account so that’s the payment of the product sorted out. The majority of startups are obsessed with the web as the platform and the constant mentioning of putting stuff in the cloud. The reality is that potential customers are all over the place and watching television is still a time chewing pasttime, we just need to make the shopping connection a little better. 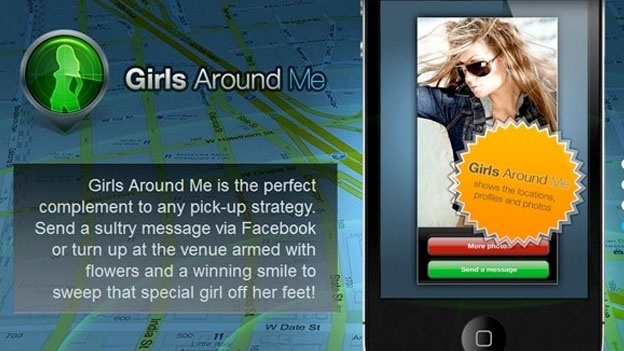 Nothing like an app called "Girls Around Me" to cause a stir…. For ten long years, possibly longer, I knew this day was coming. Since the idea of floating data and API’s was a dream in the bowl of my hipster hat, I knew the day would happen. And boy did it happen…. with the “Girls Around Me” app. Okay I agree the copy used on the website doesn’t help matters at all but there’s nothing like a storm in a very small teacup to get the tech press on their keyboards bashing away until the sentences come flying out. The issue here my friends is not the app itself. The girl aspect, while not the be all and end all of apps but causes the most prudish of journalist to come out all guns blazing. It’s far more ingrained than that. If the app were “Dog Walkers Around Me”, or “Coffee Lovers’ Around Me” then I’m working on the assumption that no one in the tech press would have batted an eyelid about the content nor the main issue with all of this. The main issue is the use of data for the taking…. As soon as you link your Foursquare account and Facebook account together you become a targeted dream. We now know all your likes, friends and connections and where you are. And you gave it to us for free, the most treasured jewels in your closet, the secret stuff you just handed on a plate. And now with added API loveliness you just gave it to everyone else too. With the likes of Grindr and Blendr they are very closed networks, signup and sign in but only be seen by other users on the closed system. Startups hate going this route as it takes up time to build audience. For me it’s the best solution, you know your user base and you control the currency, namely the data, that can be used be third parties. Many retailers asked me with regards to uVoucher whether it connects to Facebook, I’ve constantly declined. Stating that the data the retailer can retain is of far more importance to them than what social networks claim to offer. To offer customer insight is one thing, to actually do something with it is something else. Most people don’t in my experience. Hiving off a list of email addresses to blanket sell to is not that targeted to me. Don’t let me stop you having a social media presence but your data is your data, not Facebook’s. Yeah “Girls Around Me” with pivot into something else, quietly relaunch and hope there’s not as much fuss about the main aim of the app, finding a physical connection with another human being. I’m sure there are better ways of doing it but there you are. Ultimately – Data is my currency and I guard it. Those who know Matt (aka @cimota) know the amount of work he’s put into Digital Circle over the last few years. So it’s nice to know that he’s pushing things along with his own startup “Conquest Dynamics”. Now the startup is on seedups.com and I think it’s worth shouting about. I’ve just copy/pasted his original blog post here to try and get the word out a bit more. Good luck Matt and the rest of the team. Though, to date, we’ve had one inquiry. So rather than hide it all behind a wall, here’s what we’ve written. As my theory is that telling no-one was getting us nowhere, I’m now telling everyone. We will need an initial £200,000 of funding to produce the first game and the development of the initial IP for the second and third. We are not aiming for the 69p market, but rather delivering some new ideas in social and multiplayer games which will drive payer recruitment and engagement. Our initial game has a basic game design document but this also needs enhancement and we are keen to find additional advice as well as funding to assist in the delivery of this. The opportunity in a global, networked marketplace is immense thoughwill only be realised through appropriate marketing, use of social media and development of a die-hard player community. We aim to sell more than a million copies of each game each year and establish four important new properties over the next five years. We will make games and sell them. A lot. We have one developed idea and three further games on the slate and a dozen more in the distance. We are aiming for a market segment that is at the intersection of 11M subscribers to World of Warcraft and 65 million iPads. We will be targeting a sector we know well. Gamers who have limited time, some money to spend and a desire to play games which have more depth than casual games. We’re targeting gamer dads. To be decided. Come and talk to us. We’re looking for a committed partner who will provide more than just funding. We’re in for a roller coaster; we have big plans so come and talk to us. We will be developing new content-based intellectual peoperty based on original ideas and tell engaging stories.